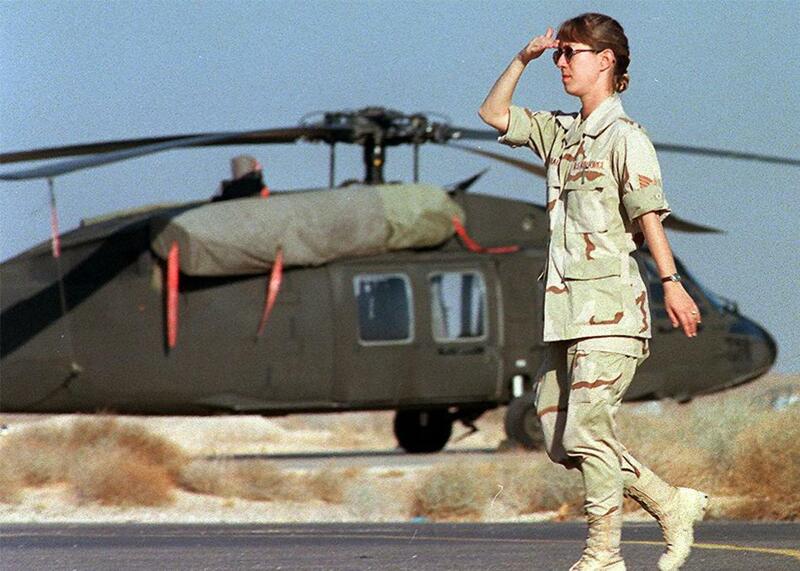 They can serve with valor in combat roles, but feminists have clashed on the issue. Lt. Ferrau from the Task Forces 1-30 North Carolina walks in front of a U.S. Helicopter, close to the Iraqi border on Dec. 20, 1998. Women should be required to register for the draft along with men, top-ranking military representatives said on Tuesday. At a Senate Armed Services Committee hearing, Army chief of staff Gen. Mark Milley and Marine Corps commandant Gen. Robert Neller testified that since the Department of Defense struck down all military restrictions based on gender in January, and women are now serving in combat roles, there’s no reason to exclude them from Selective Service requirements. Current Selective Service law requires all “male persons” to register within 30 days of their 18th birthday. The U.S. military has been an all-volunteer force since the ’70s, but the draft still includes all men up to age 25 as “a very, very, very inexpensive insurance policy,” Selective Service System Director Larry Romo told KPCC in October. When Defense Secretary Ash Carter announced in December 2015 that the department would end all gender-based exclusions, the chairmen of the Senate and House Armed Services Committees gave Congress 30 days to consider the decision’s impact on Selective Service law. It renewed a debate that began in January 2013, when then–Defense Secretary Leon Panetta broadcast his plan to end the military’s ban on women in combat roles, a recommendation made unanimously by the Joint Chiefs of Staff. Back then, some argued that lifting of the ban might legally force Congress to either include women in the draft or scrap it altogether for good. In fact, some activists, like Elaine Donnelly, president of the Center for Military Readiness, opposed lifting the combat-roles ban precisely because it could affect civilian women, who’d be forced to sign up for the draft. In the ’70s and ’80s, though polls indicated that more than 70 percent of the country supported the Equal Rights Amendment, some people opposed it because they believed it would require women to serve in the same military roles as men, including combat units, and to register for the draft. Feminists were divided on the issue—though the vast majority agreed that women were physically able to serve in any military capacity, pacifist feminists could not support the expansion of an institution they believed was fundamentally destructive and immoral. “The dilemma for many feminists became trying to deny that the intention of the ERA would be diluted by gender considerations in military service, while not recommending the extension of conscription for another segment of the population,” wrote Swarthmore College Peace Collection curator Wendy Chmielewski in 1989. In 1980, when President Carter requested that Congress reinstate the draft, he also recommended it allow the president to evaluate the military’s needs upon possible future conscription and make a decision then about whether and how to include women in the draft. Congress did restore Selective Service registration but did not add any provisions for the inclusion of women, chiefly because the Department of Defense did not allow women to serve in combat roles. Members of Congress also argued that there was no pressing need to widen the draft pool by adding women and that it might harm existing social structures. The National Organization for Women issued a statement opposing the draft, but stipulating that if a draft must exist, it should include women. Though Congress is highly unlikely to ever resume active conscription, the purpose of a nationwide Selective Service registry is to enforce an equal distribution of the burden of war. Since the Vietnam War, when the wealthy and powerful easily avoided the draft, most easy-to-access deferments have been scrapped. If the draft is to have its desired effect—forcing decision-makers in the federal government to personally grapple with the severity of sending combat troops overseas and lessening the disproportionate consequences of war borne by poor communities and communities of color—women must be implicated by its reach. Military officials can debate how and where drafted women will serve according to their merits when and if the unthinkable comes to pass. For now, it’s up to Congress to align one of our country’s last remaining discriminatory laws with today’s military reality.